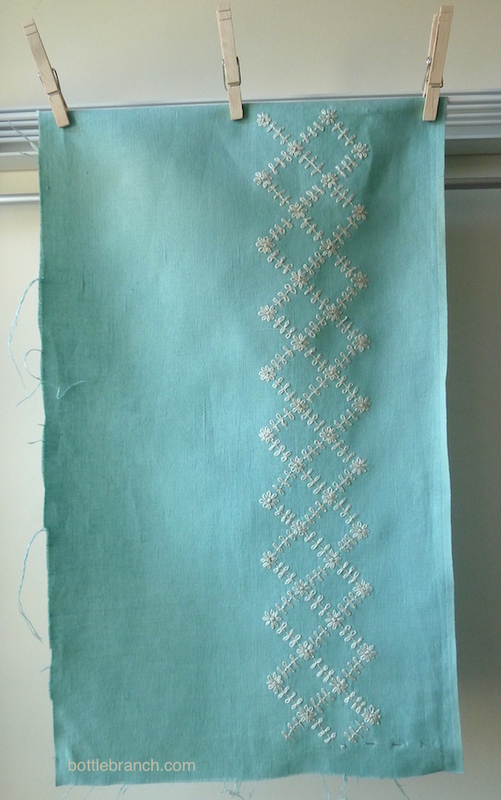 On historically-inspired embroidery, and moving from project to project. Are you familiar with the children’s book, If you give a Mouse a Cookie ? It concerns a pesky little mouse who moves from one activity to another, eating a snack, cutting his hair, drawing pictures, and more, until he eventually comes full circle, back to the first activity of eating a snack. 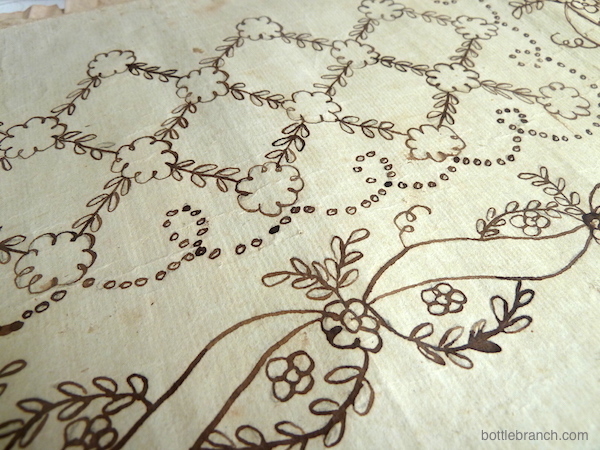 A few weeks ago, I posted about these embroidery patterns, drawn by my three-times great grandmother in the early 1800’s. I neglected to mention that I was working on this stitching project based on one of those patterns. Initially, I was excited to work with all white treads on the colored linen, to lighten and simplify, and to adapt the design, rather than re-create historic work. I had planned to stitch most of the historic design, including, the elegantly looping dots, which are clearly meant to be French knots. But after writing the post on the history of these designs, and looking more carefully at historic embroidery, I’m already thinking about what I will do differently next time. 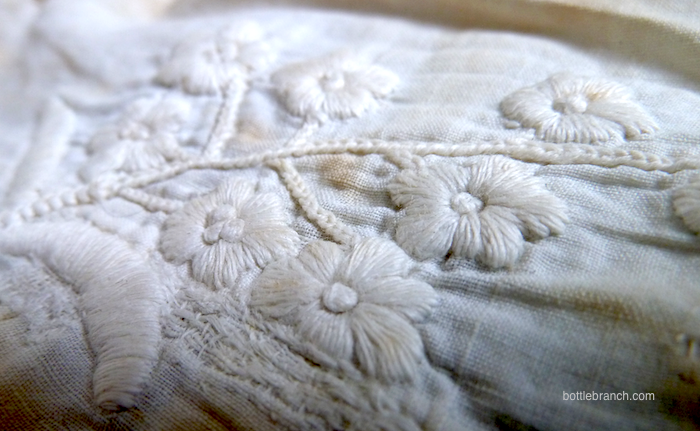 The whitework example I have from my 3rd great grandmother is more fully filled with satin stitch, rather than executed it in the open stitches I’ve used in my piece. 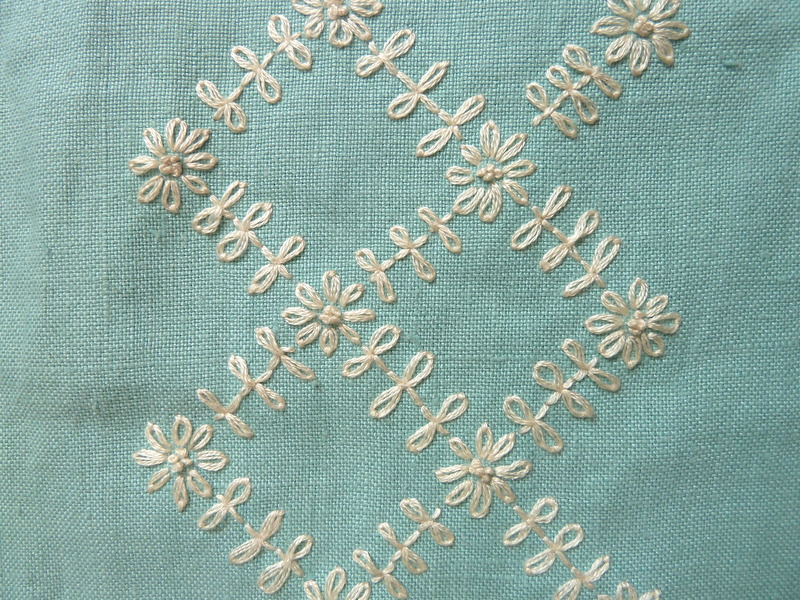 In fact, I’m guessing this whitework might also be considered crewel work, since the threads look like wool. And there are other examples of historic embroidery here and here and here. Though I’ve learned from it, I’m abandoning this, my first historically inspired embroidery piece. Only, I won’t exactly abandon it. The embroidery is finished enough to make into something, and, in keeping with the historic needlework theme, I decided to make a reticule (O.K., a drawstring bag). That’s when I started to feel like that mouse in the story, because in planning how to make this bag, I was drawn into another creative project. And it was not snacking-related. That project will be the subject of a separate upcoming post. I do understand exactly how this going off at tangents happens. For me, it’s most often what happens when I’m reading something. I’ll have my interest piqued in some tangental subject and go off on that, and on and on – yep, it’s a familiar tale. 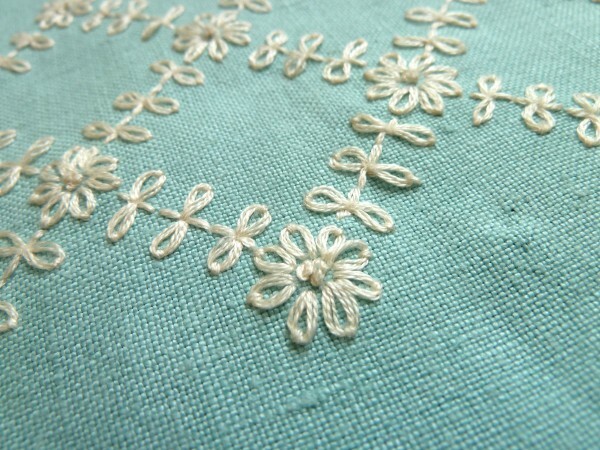 How delicate your embroidery looks – very elegant indeed. Thanks, Anny! Reading can do that too, but I find it happens to me on wikipedia, clicking through one link to another. what an exquisite heirloom you have produced!!!! Thanks, Kate! I’m not sure abobut the heirloom part, but then again, I am always looking forward to the next thing!